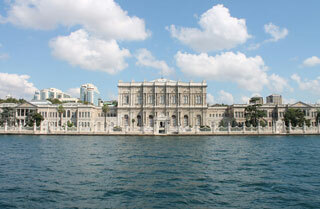 Dolmabahçe Palace served as the main administrative center of the Ottoman Empire from 1856 to 1887 and 1909 to 1922. The construction cost five million Ottoman gold lira, or 35 tonnes of gold, the equivalent of ca. $1.5 billion in today's (2013) values. This sum corresponded to approximately a quarter of the yearly tax revenue. This article uses material from the Wikipedia article "Dolmabahce Palace", which is released under the Creative Commons Attribution-Share-Alike 3.0 License.